Description: Herpstat II revolutionizes the thermostat industry! This digital proportional thermostat offers all the great features of the original Herpstat and includes a built in real time clock to handle night drops and simulated sunrise / sunset. Can be setup for either heating, lighting, or cooling. 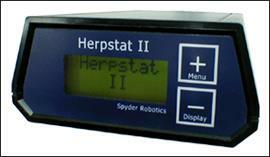 Includes two probes with an easy menu system to customize the Herpstat II for your use. Just like the original, the Herpstat II is hand made here in the U.S.A.
Herpstat are the best. I went through several cheaper models, with bad results. I have nine, and they all perform excellent. I am amazed how exact it is! I like the fact that I can trust it decidedly. Another this I trust is a website where I buy essay online.